The microwave vegetable drying machine is a set of specialized equipment that is used to dehydrate fresh or seasonal vegetables by microwave. 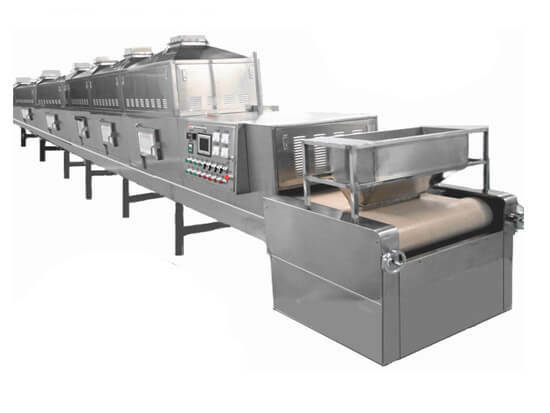 This vegetable drying machine can be used to process many kinds of vegetables like carrots, cabbage, etc. 2. Dealing with the fruit by microwave can achieve drying and sterilizing simultaneously, which improves the quality of the products and makes it safe to eat and eco-friendly. 5. Large capacity, high efficiency, and reliable performance. Bananas and apples are perfect for microwave dehydrating because they are both full of fiber, which means when being dehydrated, the moisture is totally removed from them. Just choose the kind of meat that you like, pound it out to thin strips, dehydrate the meat thoroughly and season it with some pepper and spices, then you will have your own personal brand of beef jerky. Low-moisture vegetables like carrots and peas can be dehydrated. This is a great way to save your backyard garden harvest in a, particularly bountiful year. While fresh herbs are best, you can use your microwave dehydrator to make bottles of your own dried herbs to save you a trip to the grocery store when your herb plants are not producing. Cube the bread and pop it into the dehydrator with some garlic and parsley. The dehydrator will remove all of the moisture from the bread, leaving you with delicious croutons to sprinkle over your salad.